Queen Christina reflects on being alone. The Hermit knows that every individual needs solitude from time to time in order to reflect on the various mysteries of life. The Hermit realizes that the noise of other lives can distract from hearing one's own song. Some people tend to take this a little overboard, however. 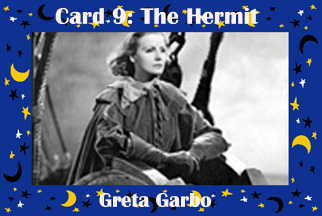 Queen Christina was pirated away from Greta Garbo Gallery.